I’m in Australia for the third year in a row, the second year as part of the Unlock Excel conference. Sponsored by CPA Australia, Unlock Excel brings together six Excel MVPs to present new technologies, and review existing technologies, in front of leading accounting and finance professionals. At this point, we have finished two-day conferences in Melbourne and Sydney, and we’re gearing up for the finale in Brisbane. The Excel MVPs on this trip include Liam Bastick, Tim Heng, and Mynda Treacy from Australia, Gašper Kamenšek from Slovenia, Ken Puls from Canada, and myself, Jon Peltier from the United States. Liam and Tim are financial modelers at the consulting firm SumProduct LLC, which also provides live and video training. Mynda and her husband Phil run My Online Training Hub, which hosts a blog and many online courses covering Excel dashboards, Power Query, Power Pivot, and Power BI. Gašper runs the Excel Unplugged blog and offers advanced training in Excel, Power Query, Power Pivot, and Power BI through his new Excel Olympics website. Ken is an experienced author, trainer, and blogger on Excel and Power Pivot technologies and runs the Excel Guru site. I specialize in charting and VBA programming, through training, custom programming, and my Excel charting add-ins, and you can read my blog here at Peltier Tech. The MVPs are covering Excel topics like Pivot Tables and Pivot Charts, Formatting and Styles, Tips and Tricks for Charts and for Excel, Range Names, Data Validation, Automating Charts and Reports without VBA, and Customizing Excel. They are discussing financial modeling, budgeting and variance analysis, modeling of working capital, and KPI reports. Business Intelligence topics include deep dives into Power Query, Power Pivot, Power BI, and Dashboards. Microsoft has sent Annie Colonna, a Program Manager on the Excel team, to highlight some new features of Excel and to share insights into how Excel will continue to develop. Annie and the MVPs have had several rousing discussions with conference attendees in daily Q&A sessions. Posted: Monday, April 16th, 2018 under Conferences. 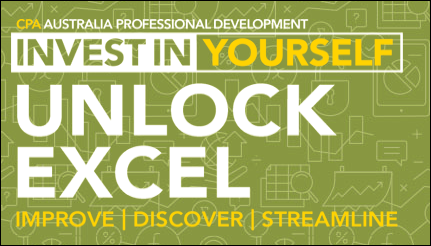 This is the second year that CPA Australia’s Unlock Excel visits Australia with two-day conferences by Microsoft Excel MVPs. While CPA Australia focuses on accounting and finance professionals, Unlock Excel is geared towards people who want to unlock the full potential of their data. You will enhance your Excel skills, while becoming more efficient, exploring new tools and applications, and streamlining your existing processes. Unlock Excel will feature a range of topics including charts and dashboards, financial modelling, VBA, and Power BI. You will learn valuable time-saving techniques to take your current knowledge to the next level. You will also learn to corral your own intricate data sets, and uncover unique insights. This will add value to discussions and analyses and drive effective data-based decision-making for your business. Microsoft chooses MVPs annually based on their high level of public community contributions, not just quantity, but high quality contributions by technical experts in their field. Excel MVPs discover the best ways to use Excel and other Microsoft products, and are passionate about sharing those techniques with the world. This year’s MVPs include Ken Puls, Liam Bastick, Mynda Treacy, Gašper Kamenšek, and yours truly Jon Peltier. Visit the CPA Australia site for more information and to register. Posted: Thursday, March 15th, 2018 under Conferences. There are two exciting international conferences coming up in the next few months. I will be participating in my third Amsterdam Excel Summit and my second tour of Australia and New Zealand. Join four leading Excel experts and learn about advanced data analysis and reporting techniques. Gašper Kamenšek, Oz Du Soleil, Jon Peltier, and David Hoppe will guide you through working with data, building a model, and designing a dashboard. Register here for these events. 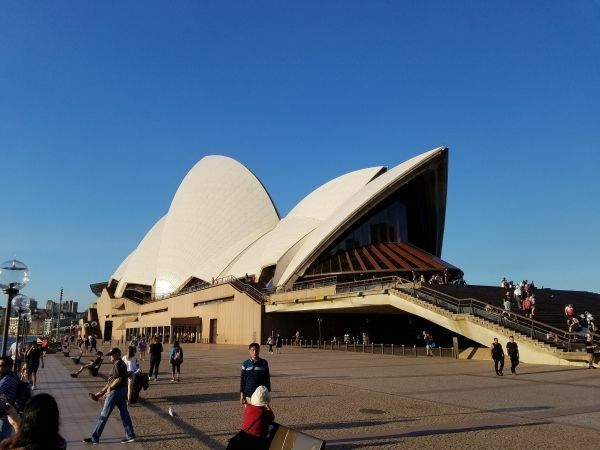 For the second year in a row, the Excel MVPs tour Australia and New Zealand with a series of conferences aimed at accounting and finance professionals. Sponsored by CPA Australia, this year’s tour expands to four cities. The experts are Liam Bastick, Roger Govier, Ingeborg Hawighorst, Jon Peltier, Ken Puls, Mynda Treacy, and Chandoo (in Auckland only). Topics include Modeling, Charts and Dashboards, Power Query, Power Pivot, Power BI, Spreadsheet Best Practices, and more. Microsoft PMs will also be present, sharing insights into new Excel developments. Posted: Monday, February 13th, 2017 under Conferences. Last month I and several of my colleagues descended on New Zealand and Australia for Excel Summit South 2016. This was a series of two-day Summit conferences, one each in Auckland, Sydney, and Melbourne. The first thing I have to say is that our major sponsor PwC was a perfect host. Their facilities were excellent. Our sessions were in conference rooms on about the 20th floor of their towers in each city (the views sometimes making concentration difficult). I had a chance to present my on my specialties (VBA and, uh, charting), but also to see what my fellow MVPs had to say on topics I should learn more about. I also got a glimpse into financial modeling, which is not something I usually think much about. The attention to detail and aversion to mistakes are things I aspire to, and it was instructive to see these in a new context. Besides myself, the Excel MVPs in attendance were Liam Bastick (from Australia), Ken Puls (Canada), Charles Williams (UK), Bill Jelen (US), Ingeborg Hawighorst (New Zealand), and Zack Barresse (US). Liam talked about avoiding spreadsheet layout errors, problems with Excel’s various lookup functions, and studying sensitivity and running simulations without VBA. Ken and I did a tag-team presentation, where he started by showing how to use Power Query to fix up some ugly data from disparate sources and I showed how to turn his cleaned up data into a flexible dashboard. Ken later did a session on Power Pivot. Bill “Mr. Excel” Jelen did a session on data visualization using conditional formatting, another on pivot tables, and finally he showed some cool Power Map analyses. Ingeborg showed us how powerful are Microsoft’s web and standalone Power BI tools. Zack showed off some little known features of Excel tables, and Zack and I both discussed using VBA to make life easier. Finally Charles presented on making VBA run like the wind. 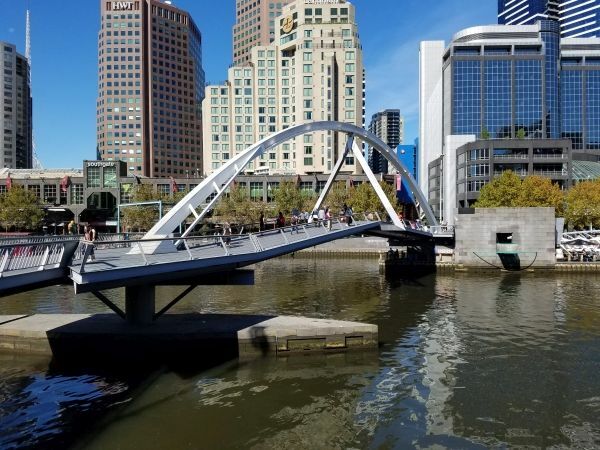 Other experts included Felienne Hermans (Delft University), Ian Bennett (PwC, Australia), Smila Baliga (PwC, US), and Andrew RevFeim (F1F9 in New Zealand). Felienne described her research on testing spreadsheets. Smila discussed ways organizations can cope with their overabundance of spreadsheets. Ian and Andrew covered modeling standards and best practices. Ben Rampson and Carlos Otero from the Microsoft Excel product team were at the sessions. The presented information about where Excel is going, with the emphasis on BI and with the new versions running on whatever platform you can name (Windows, Mac, iOS, Android, etc.). Their presence is evidence of Microsoft’s recent opening up to customers and users, sharing their plans and listening to feedback and suggestions. Attendance was pretty good, increasing in the later dates as word about the sessions spread. The technical level of attendees at this kind of session is usually high, since the audience is self-selected. But at these meetings I felt the people who attended were very good at their jobs and at Excel. They asked challenging questions, and conversations between and after the sessions were stimulating. I met a number of people in person that I’ve known for years over the internet. Jeff Weir(d), who has posted on Chandoo’s blog and Daily Dose of Excel. Doug Jenkins, who writes about using Excel for Engineering problems at Newton, Excel, Bach. Ed Ferrero, a former Excel MVP who now runs a winery. Probably more as well, and when I remember I’ll add them here. 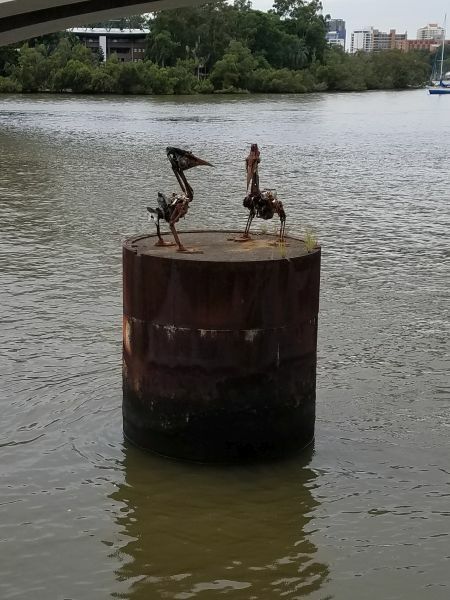 One of the great things about this kind of trip is getting to visit new places. I didn’t get to do a lot of sightseeing, so I plan to come back. I’ll see if my wife wants to come along. Besides the scenery, the cities we visited had nice restaurants. Among noteworthy meals we had outstanding Middle Eastern food in Auckland, an extensive feast in a Brazilian barbecue in Sydney, and delicious Indian food in Melbourne. The coffee in even the simplest shops was far superior than most donut shops in the States, but I guess that’s to be expected. Somehow I only managed to put on a couple pounds. 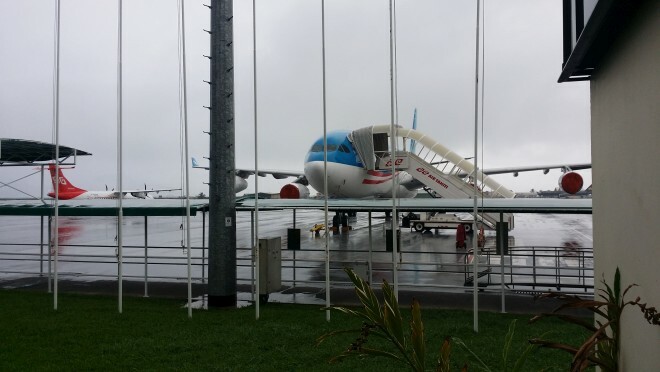 I got to visit Tahiti, but only for two hours while they refueled the plane. The airport was very small, with one landing strip and a taxiway. On one side of the runway was ocean, on the other were neighborhoods and the small terminal building. I don’t suppose they get more than one or two jet flights a day, and you need to use the portable stairways to board the plane. It was raining hard, with temperature in the 90s (or as they say, the 30s) and humidity close to 100%. Our first real stop was in Auckland, New Zealand. It rained for a couple days, which was okay, because Ken and I were stuck getting our joint presentation working. 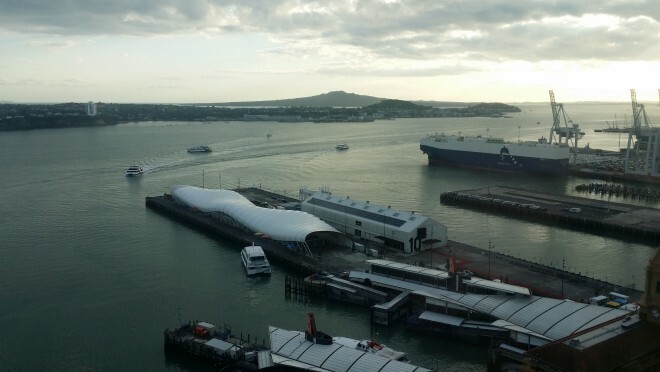 The view of Auckland Harbor from the PwC tower was awesome. 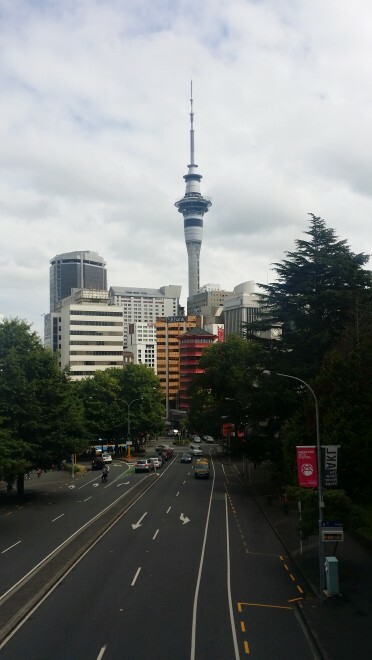 The Sky Tower looms over central Auckland. Our hotel was a block or two away, as were numerous restaurants and shops. 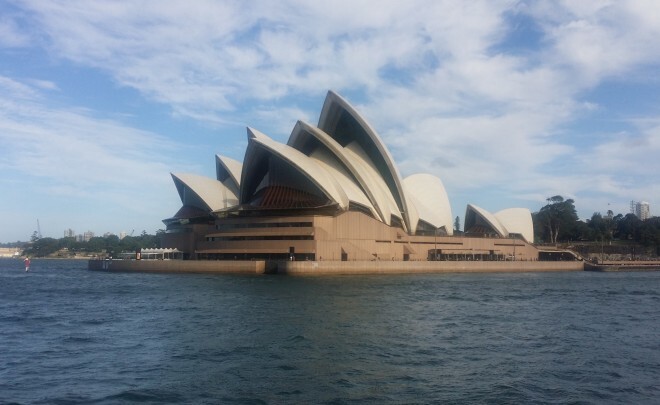 The weather in Sydney was gorgeous. My wife told me I’d better enjoy it, since it was snowing back in Worcester. 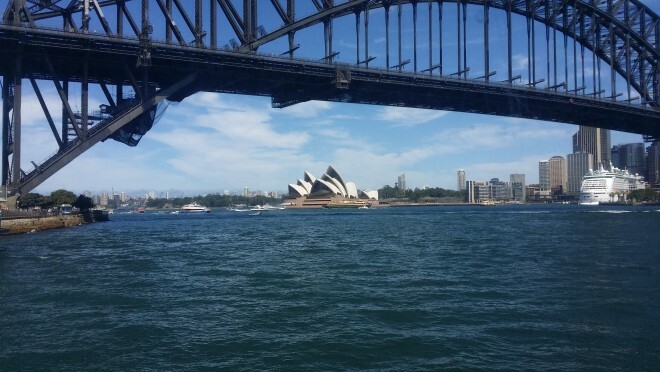 On a beautiful Sunday afternoon we took a ferry ride through the harbor. On the way we went under the Harbor Bridge and past the Opera House. 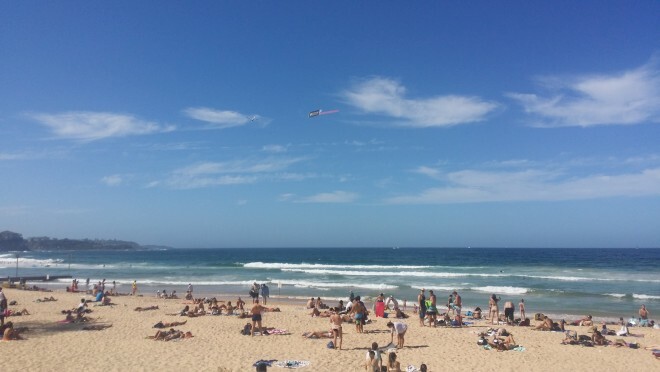 Our ferry ride took us to Manly Beach, which was very crowded because of a surfing competition. 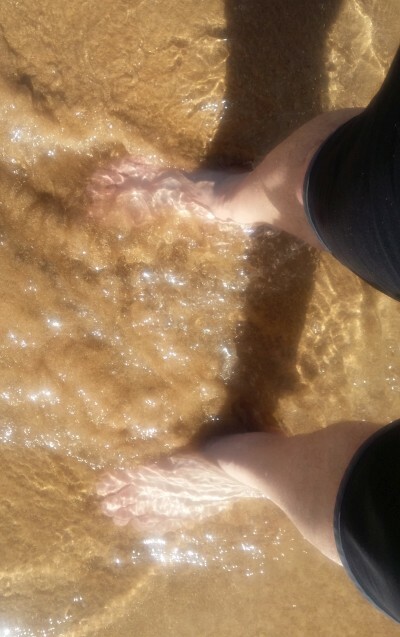 I got to sick my feet in the Pacific Ocean. Being from Massachusetts I usually only get to the Atlantic, but they’re equally wet. On the ferry ride back we again went past the Opera House. 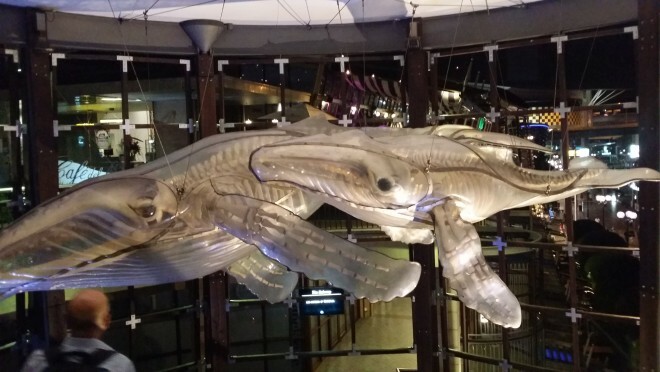 This mother and baby humpback were gracefully swimming over a stairwell in Darling Harbor, a small branch of the enormous Sydney Harbor. I was captivated by this intriguing sculpture, showing skeleton inside translucent plastic skin. 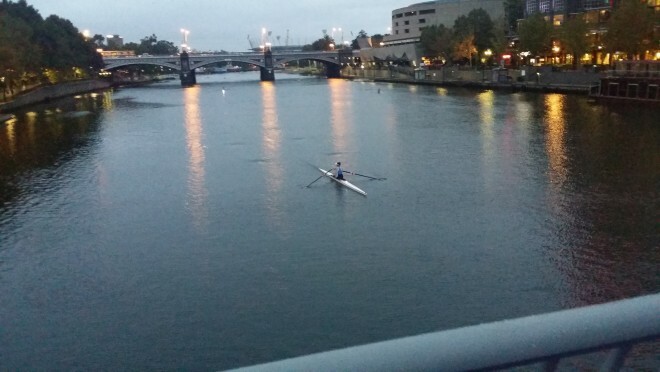 Early in the morning, you can see rowers on the Yarra River, like this single sculler and the half dozen or so in the distance. 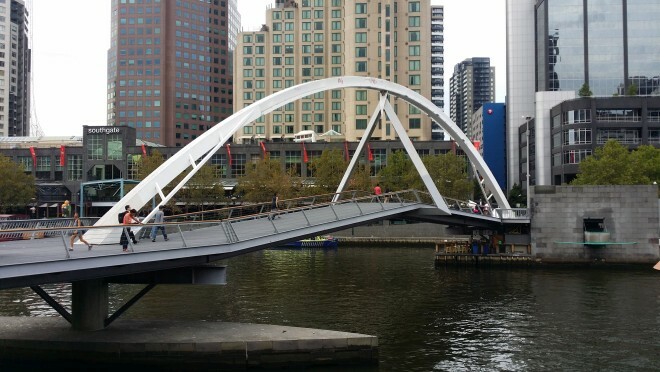 We took this scenic footbridge across the Yarra from our hotel to the PwC facilities. 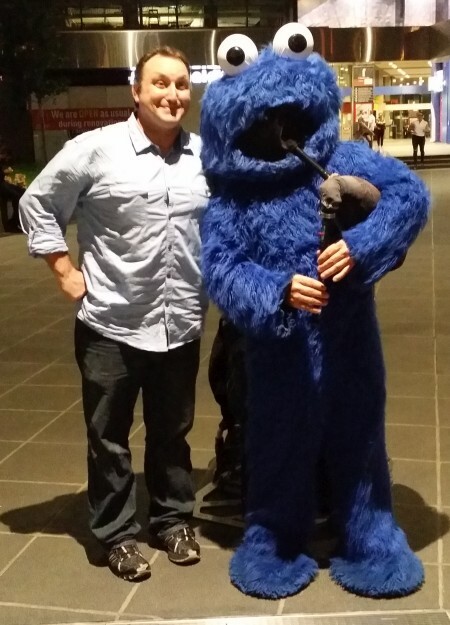 During a street festival on Friday night, Zack Barresse met up with a bagpipes-playing Cookie Monster. Zack wrote about our travels in Excel Summit South in Review. All good things have to come to an end, so after two weeks I returned home again (which is also a good thing). 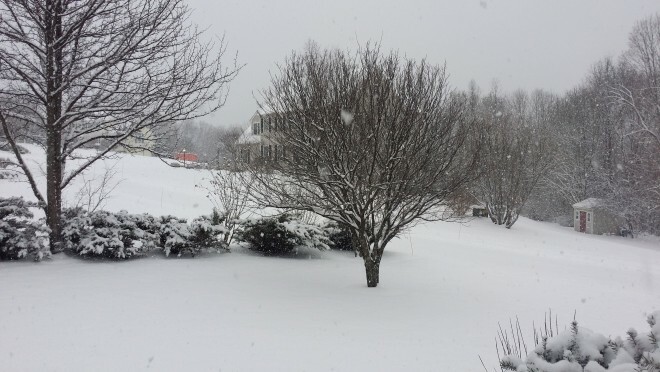 On the first day of spring, a week after my return, Mother Nature greeted me with this springtime scene. It was a very mild winter in Massachusetts, especially compared with last year. But since the springtime snow pictured above, we’ve had snow on two more days. Posted: Tuesday, April 5th, 2016 under Conferences.